Ask someone to name a unique Australian animal and most likely they’ll say kangaroo, platypus or koala. But we should also spare a thought for our unique birds. Our parrots are not only visually spectacular – with splashes of every colour, in every size and shape – they are also some of the smartest and longest lived birds in the world. Our songbirds — ravens, honeyeaters, magpies, bowerbirds — have some of the greatest minds of the animal kingdom. They go fishing, remember people’s faces, mimic other species and even play hide-and-seek. They stay younger for longer than Northern Hemisphere species and can live twice as long. This is no coincidence. Parrots and songbirds evolved in East Gondwana (now Australia), which was spared from that dinosaur-obliterating asteroid 66 million years ago. Ever since then, their homeland has been a warzone of natural selection: floods, droughts, insect plagues, cyclones, and cataclysmic bushfires. When there is nothing to eat and nowhere to sleep, populations must adapt or perish. That is why our birds have some very special abilities. Many have great spatial memory — how to find a pond in the middle of the desert — we see childhoods, food preparation, and centenarians. This exquisite set of adaptations is the key to survival down under. But genes only get animals so far, these behaviours also require lots of practice and learning. Nest building is a superb and distinctly avian adaptation. Once thought to be almost robotic, we now know “nest building isn’t simple, it isn’t automatic, it isn’t instinct,” says Kaplan. “Weaver birds make elaborate hanging nests. Juvenile males build them but they fail. They learn by trial and error”. Like us, birds must spend large chunks of their lives learning. In 2008, birds, like primates, were shown to have mirror neurons – segments of the brain committed to cognitively emulating others for complex behaviours. Our arid and often nutrient-poor country has forged bird brains capable of feats of intellect not seen anywhere else in the animal kingdom (ignoring us, of course). Ravens love bread, but bread means more than food to their sophisticated minds. Ravens have been observed picking up bread, flying it to a pond and placing it in the water. The bird waits until fish begin to nibble at the bread and catches them, enjoying a big seafood dinner instead of a little bit of bread. Professor Kaplan also relayed another example of delayed gratification, a potentially scorchy one. To overcome food shortages, our birds also work out ways to eat things most other creatures can’t. 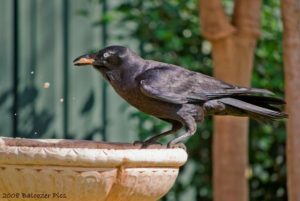 While the cane toad has ravaged much of our native wildlife, crows and currawongs have found a solution. They flip over their poisonous meal, where there are no poison glands, and eat the toads’ bellies. Gordon Ramsay, eat your heart out (actually, I imagine that’s precisely what the birds would do). This type of complex reasoning also helps in other parts of bird life: socialising, bonding, and deception. Ravens, for example, are very socially savvy. Like bone-burying dogs, ravens will hoard excess food. But not only do they remember where their own caches are hidden, but also their flock mates’. Understandably, when hiding food, ravens try their best to be secretive about it. But their intelligence goes beyond remembering where their friend’s stash is; when burying their own food, they’ll remember specifically which ravens were watching them. When a hidden cache is approached by a bird that observed it being buried, the cache will quickly be moved. However, when their cache is approached by a naïve bird, the caching bird will not bother moving it. Kids can’t even do that. So, next time someone asks you to name a unique Australian animal, spare a thought for our beautiful, unique and highly intelligent birds. 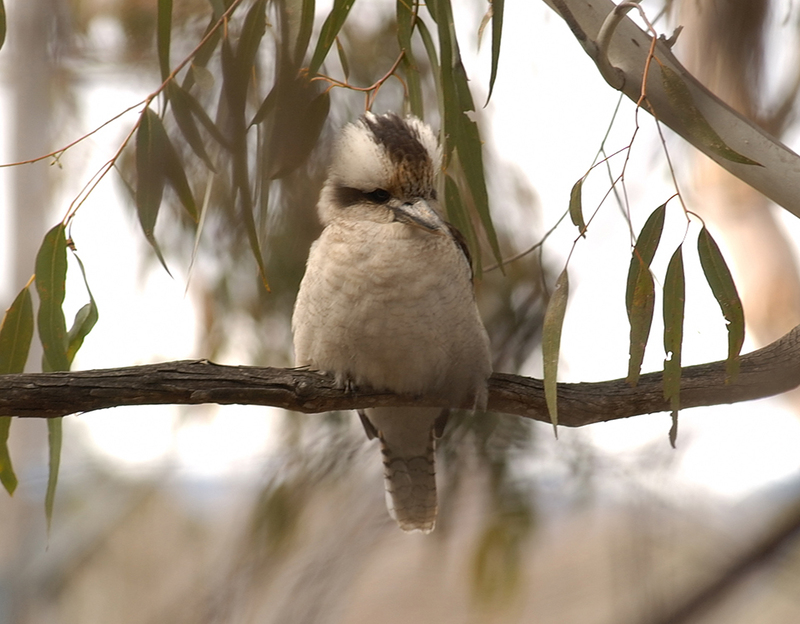 Want to read more about amazing Australian bird behaviour? Get a copy of Professor Gisela Kaplan’s book Bird Minds: Cognition and Behaviour of Australian Native Birds, now a winner of the prestigious Whitley Award for Behavioural Zoology. Our magical (marine) world of Oz! I have a Magpie waiting every evening with her two ankle biters to claim a piece of my left-over sandwich on my way out of the building. She missed me a few times initially when I left at a different time, took my hat off or went over to the pool cars; but no chance any more to escape that way – they recognize me now any time! So I better have a piece of sandwich left on the way home when she plonks herself on the ground right next to me, looking at me ‘asking’ “where’s my bit”?! Best bird song of late on mid north coast of NSW, the butcher bird. Quite a range of beautiful songs for this hot weather. And sulphur crested cockys in SUtherland Shire know the exact time the 7 o’clock news begins, a mob of 20 or 30 of them wheeling and screeching overhead to utterly defeat hearing the TV. That’s playful but if they were smarter they’d sit on the window sill and watch. Pity that the Tasmanian Raven has not learned to drag roadkill off the road instead of risking becoming the next victim…..although rarely have I seen a dead Raven on the road.. Yes Theresa they are very casual about slowly hopping away as a car approaches them and I have only seen a couple dead on Tasmanian roads in my driving around the highways and country roads. However my wife and I have once witnessed a couple of Tasmanian Ravens tearing parts from the body of a possum and dragging them to the verge, which we both commented on at the time as pretty clever. We also have a pair of Crows living around our property in Queensland and these 2 will dunk pieces of bread in the bird bath before eating it just as the article says.